The draft has come and gone. All relevant free agents have re-signed or found a new home. We’ve officially reached the dog days of the NBA offseason. And rather than spending the day watching baseball or debating whether the Redskins will go 4-12 or 5-11 this year; why don’t we rank the top five Eastern Conference teams? Did you see that team LeBron carried to the finals? Since LeBron re-signed with the Cavs (surprise, surprise) they are cemented here in the one spot. Let’s keep moving. The Bulls are here by default. Yes, Tom Thibodeau got fired but regardless, what the Bulls did during the regular season last year was very impressive. Their pre-season projected starting lineup of Derrick Rose, Jimmy Butler, Mike Dunleavy,Pau Gasol, and Joakim Noah started just 21 games collectively as a unit. On top of all that, sixth man Taj Gibson missed 20 games. Most teams would have collapsed if their starting five was only available for 21 games, but the Bulls were able to right the ship and put together a very impressive 50-32 regular season. The Bulls locked down Most Improved Player Jimmy Butler to a five-year $94.3 million deal. Additionally, they re-signed their glue guy Mike Dunleavy in a three-year deal as well as veteran point guard Aaron Brooks. Regardless of the coaching change, keeping their key core players together makes it clear to the rest of the Eastern Conference that the Bulls are here to stay. They’ve shown that they can whether the storm dealing with the oft-injured Rose and constant changes in the starting lineup. Will the Bulls compete for a championship? Probably not, as I believe that window has closed; but it doesn’t mean they can’t be competitive and lock down a top spot in the Eastern Conference. The Hawks surprised the entire NBA going 60-22 during the 2014-2015 regular season including an impressive, 19 game win streak. The Hawks would end up getting swept by the Cavs in the Eastern Conference Finals to put a forgettable ending on an unforgettable season. So where do they go from here? The Hawks will still stay relevant in the Eastern Conference, but it’s reasonable to think that they will take a step back. The Hawks lost DeMarre Carroll to the Raptors this offseason. But that doesn’t matter since the Hawks play team ball right? The Hawks having a glaring hole at the small forward position with Carroll’s departure. Currently, they have just Thabo Sefolosha and Terran Petteway (Rookie) on their roster at the 3-spot. Sefolosha is a defensive guy who’s past his prime whereas Petteway is a complete unknown. On the flip side, the Hawks did complete two under the radar trades acquiring Tim Hardaway Jr. and Tiago Splitter. Even with these moves, it’s safe to assume that the Hawks will regress back to the mean a bit. They still have a great core of players intact, but it’s unlikely that they’ll pull off back-to-back 60 win seasons. Many expect the Wizards to take a minor step back this season after Paul Pierce’s departure. It’s easy to see why. He knocked down BIG shots during the playoffs including the unforgettable bank shot against the Hawks in Game 3 of the Eastern Conference Semifinals. There’s no doubt that his performance in the playoffs was more than the front office expected when they signed him. But that’s why they signed him; for his leadership and playoff experience. This leaves the Wizards with no option but to rely heavily on Otto Porter and Jared Dudley when he returns from injury. In addition, the Wizards acquired Gary Neal and Alan Anderson to provide some scoring off the bench. The bottom line here is that John Wall has to take the next step as being the leader for this team now that Pierce is gone. We can talk all we want about Bradley Beal’s development into an All-Star caliber player, Porter’s development, etc. but as we saw in the playoffs; this team goes as John Wall goes. 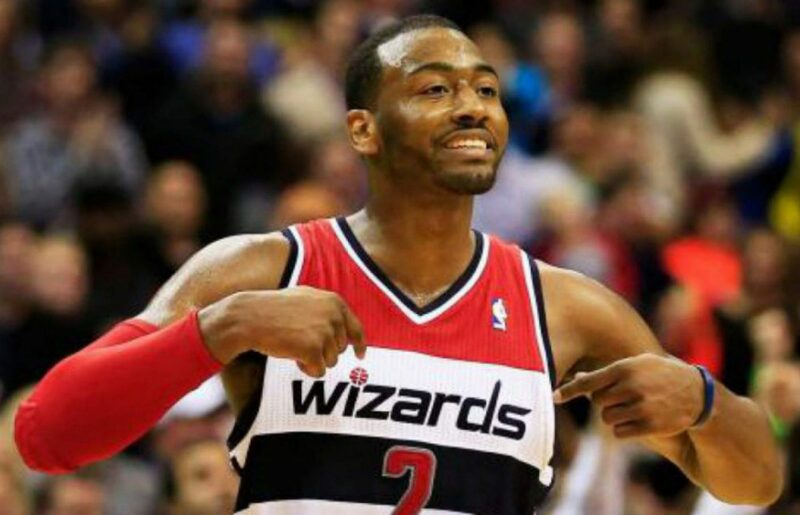 If Wall can stay healthy and continue to develop as a leader in addition to being a playmaker, we should expect another 44-48-win season for the Wizards. I think this is the year Brad Stevens puts it all together. During his first two seasons in the NBA, he’s had a bunch of unproven or underdeveloped players to work with. Even so, he was able to lead the Celtics to a 40-win season and the seventh seed in the Eastern Conference. The mid-season acquisition of Isaiah Thomas last year was huge for this team and Marcus Smart, Tyler Zeller, and Avery Bradley are only going to continue to improve. Throw in the offseason acquisitions of David Lee, Joe Crowder, and Amir Johnson; and there’s reason to believe that the Celtics will be very competitive in the Eastern Conference next season. The future is bright and the arrow is clearly pointed up for this team. Milwaukee Bucks – I flipped flopped between the Celtics and the Bucks for quite some time. Even though they didn’t make the top 5, the Bucks are quietly putting together a very nice roster. They re-signed Khris Middleton, snagged Greg Monroe from Detroit, and picked up Greivis Vasquez. Add that to a team who made the playoffs and already has some nice young talent in the Greek Freak, Giannis Antetokounmpo, Michael Carter-Williams, and Jabari Parker. Parker is a bit of an unknown as coming back from ACL surgery is never a sure thing but regardless, there’s no question that this team should be fighting for the 5-seed or even better if things really click.